Labor Day is right around the corner, and for many the last days of summer before school starts back. When my kids were in school, I always tried to have a treat for them on the last ‘weekend of summer’. In that spirit, I am posting one of my family’s ‘updated’ summer sweet treats. Ice cream sandwiches, you can make these at home, as much from scratch as you choose! I recently made these at my home and photographed my progress. Now, I would say I only did about three- quarters of this from scratch, choosing to let the store help me with the ice- cream, and preparing the cookies in house. Now, if my youngest had been making this, the ice cream definitely would have been being churned in our kitchen, and it would be a toss up if she would have made the cookies from scratch, purchased pre-made dough, or just flat bought the cookies…. I think it would have depended on her day. 🙂 For me, the home made cookies and really good quality ice cream is the way to go – always. First step : choose your flavor combination. Which cookie and ice cream pairing suits your fancy today? You are only limited to what is available in your pantry / store. For today, I’m taking chocolate chip cookies, as it’s a classic, with a new classic, (Im sure), banana peanut butter ice cream. Want something not chocolate? Try sugar cookies with strawberry ice cream. Or snicker doodles with classic vanilla ice cream. For a spin on death by chocolate, use your richest chocolate cookies with mint chocolate chip ice cream. ….Yum! Again, the options are only limited to your imagination, what’s in your pantry or at the grocery store ! Once you’ve made your selection, then you need to decide how you are making the cookies and ice cream. And when I say that, I mean if you are working from scratch, semi-scratch or purchased all the way. It’s important to decide to plan your timing. 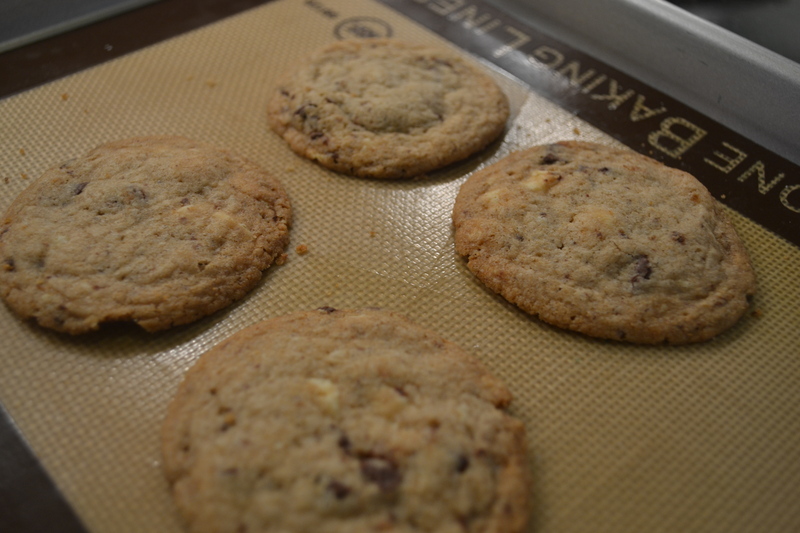 The cookies have to be baked and fully cooled before being made into sandwiches if from scratch or semi scratch. The ice cream needs to be made and allowed to set for a few hours before being scooped. (Tip: remember basic, good quality vanilla ice cream, allowed to soften slightly can be easily modified by simply mixing in your favorite flavor, cookie crumbles or candy). 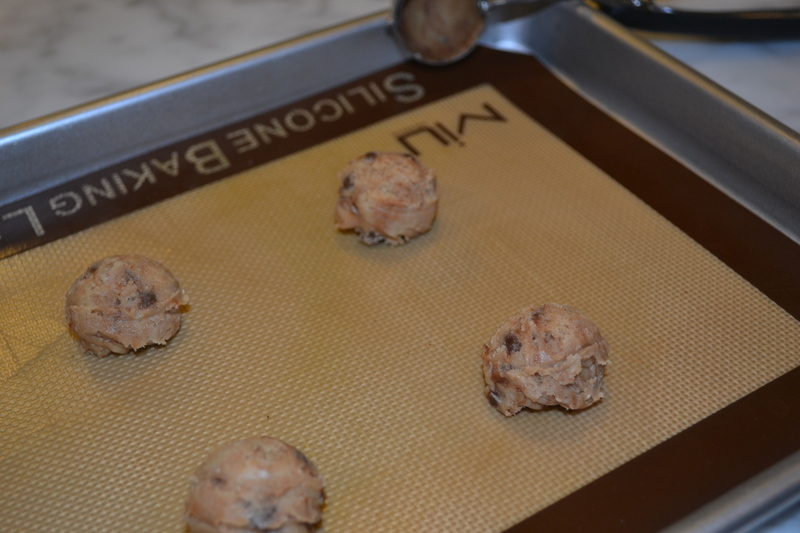 A key with the cookies (if you are baking them) is to use a round ice cream scoop or similar utensil to get the batter onto the baking tray – as they all need to be about the same size and shape. Just remember to drag your utensil against the side of the bowl to make it level. Once the cookies are cool, look at them and then choose which are most similar to be pairs. Once you have something resembling a sandwich, wrap it tightly in plastic wrap and put it back in the freezer for about 15 min – 1 hour. 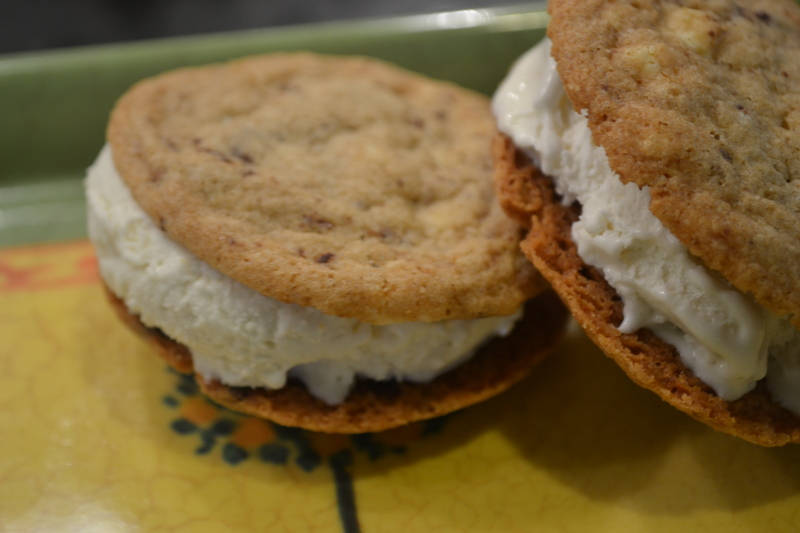 As magic is occurring, as the cookie and ice cream mold themselves into a fabulous sandwich! Then- Voila! (Tip: Don’t miss this last step of letting the cookie and ice cream become one!). You have a cold delicious updated childhood treat! Enjoy! This entry was posted in Monthly Thoughts, Recipes & Quick Baking by eloisespastries-blogs. Bookmark the permalink.